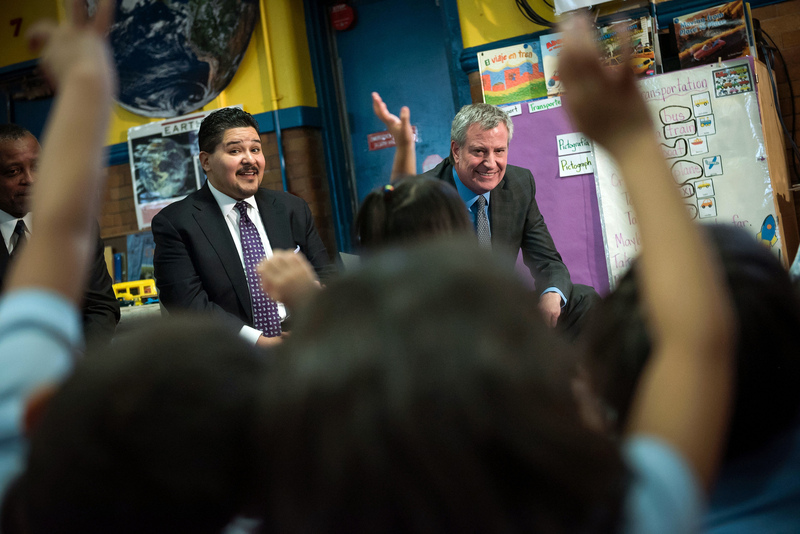 Mayor Bill de Blasio and Schools Chancellor Carranza visit Pre-K and 3-K classrooms at P.S. 25, The Bilingual School. The Bronx. April 09, 2018. Credit: Mayoral Photography Office. Last month, Mayor Bill de Blasio appointed Richard A. Carranza as New York City’s next Schools Chancellor. Carranza’s officially started two weeks ago but schools for closed for spring break. When schools re-opened Carranza went on a five-borough tour of selected city schools. On April 29, he and Mayor Bill de Blasio visited Pre-K and 3-K classrooms at P.S. 25, The Bilingual School in the Bronx. As Superintendent of the Houston Independent School District, Carranza led the effort to re-open schools after Hurricane Harvey. Carranza also previously served as the Superintendent of the San Francisco Unified School District, where he raised graduation rates to historic highs. With a strong commitment to equity and excellence, Carranza has a proven record of narrowing the achievement gap and turning around struggling schools in these diverse districts. Mayor Bill de Blasio and Schools Chancellor Carranza at P.S. 25, The Bilingual School, Bronx. Credit: Ed Reed/Mayoral Photography Office. “With a proven record of leadership and success in Houston, San Francisco and Las Vegas, and a warmth that will help him connect with students, parents and teachers alike, Richard Carranza is uniquely well-positioned to build on the incredible progress we’ve made here in New York City. Richard understands that schools are so much more than the places our children go to learn—they are the heart of our communities. I look forward to working closely with him to ensure all of NYC’s children and their families thrive,” said First Lady Chirlane McCray. In Houston, Carranza was widely praised for leading the successful effort to re-open schools two-weeks after Hurricane Harvey. This included coordinating transportation for students living in shelter and providing counseling for all students and staff. During his eight years as Deputy Superintendent and then Superintendent in San Francisco, Carranza drove remarkable progress in academic outcomes, outpacing gains in the state and narrowing the achievement gap. He raised graduation rates for African-American students by 13.9 percentage points, and for Hispanic students by 15.4 percentage points, significantly faster than the overall growth rates in California as a whole. Carranza is a fluent Spanish-speaker and accomplished mariachi musician. He is married to Monique and has two daughters.